Hello there Monday morning. The weekend was pretty cool. On Friday I left work early and did my second Brain Harmonics session. Then when I got home, The Trucker had planned a little surprise date night and took me for a really delish meal at 1920 (which I'd only found out about on Wednesday when I was looking for a restaurant to go to). We started with their 1920 Chouriço to share, which was delish. I hit a winner with my 1920 Chicken Trinchado main. It's not a normal trinchado, it's in a peanut butter sauce, but it was so yummy. Wow. The Trucker had their beef trinchado which also was good. I do love a good trinchado :) We also shared a very nice Lindt chocolate mousse for dessert. 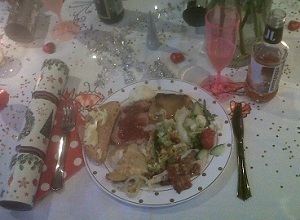 Now, I won't lie, the service did deteriorate over the evening, we asked for the bill 3 times. But by the time we were ready to leave, their little restaurant was packed to the brim and turning people away. So I'd say it's worth it. Will definitely be going back. 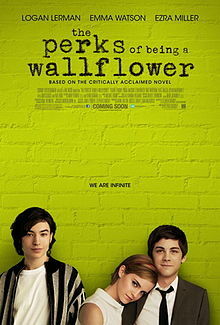 At home we watched The Perks of Being a Wallflower. I'd heard it was quite good. Neither of us was too blown-away. Star-studded cast tho! The Trucker went to meet his mom for breakfast while I was busy and then we both met up back at home. We went and did some shopping, we have my cousin's dress-up 21st in 2 weeks. Yay, another trip to Cape Town coming up next week! So happy that this time he'll be coming with me, as it should be <3 And then raced home to make trifle for 20 people! We had a Xmas in February party on Saturday evening at DJMike's place (they were on honeymoon in December). What a blast. 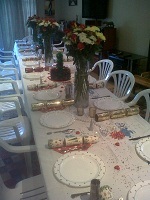 The house was decorated appropriately, there was a whole crowd of us and the food was divine, as always. 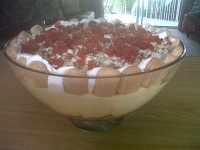 Such good food :) Our trifle came out really well too!